Officials hope the exciting archaeological discoveries will encourage a boost in tourism. Stringer/AFP/Getty ImagesMembers of an Egyptian archaeological team work on a wooden coffin discovered in the 3,500-year-old tomb in the Draa Abul Nagaa necropolis, near the southern Egyptian city of Luxor, on April 18, 2017. 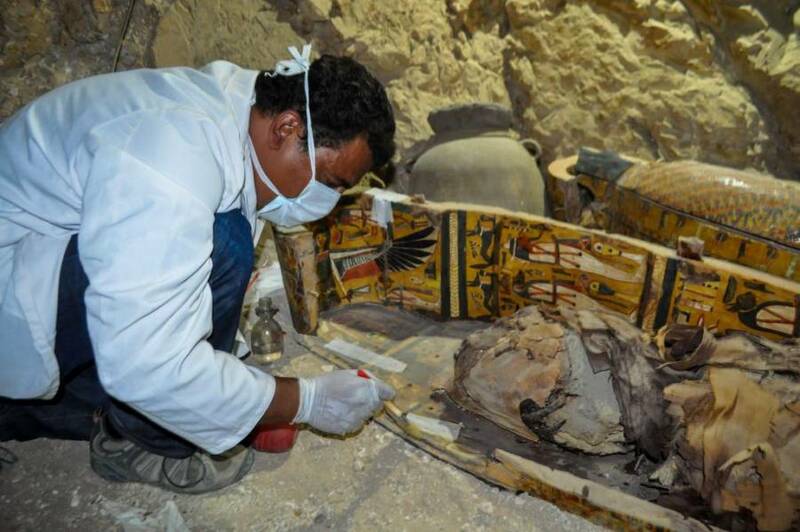 It’s hard to believe that after centuries of archaeological digs through Egypt, treasures remain hidden in the country’s vast and ancient burial grounds. Yet just this week, researchers unearthed more than 1,000 statues, wooden masks, ten colorfully decorated sarcophagi and eight mummies in a necropolis near the Valley of the Kings. 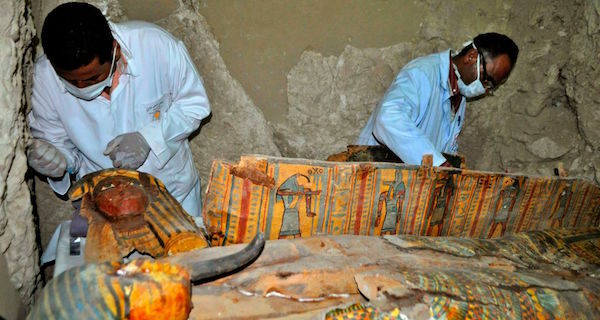 The well-preserved items are thought to be more than 3,000 years old and were found in Luxor. The tomb, which is believed to have been constructed for a judge in 1,500 to 1,000 B.C., was T-shaped. It featured an open courtyard leading to two halls and an inner chamber. One of the passages held four coffins and the other held six. The wooden coffins were painted in red, blue, black, green, and yellow and sat alongside statues traditionally meant to help the dead in the afterlife. Stringer/Anadolu Agency/Getty ImagesAn expert inspects the sarcophagus. Some of the statues depicted kings from dynasties before the New Kingdom, when the tomb was constructed. 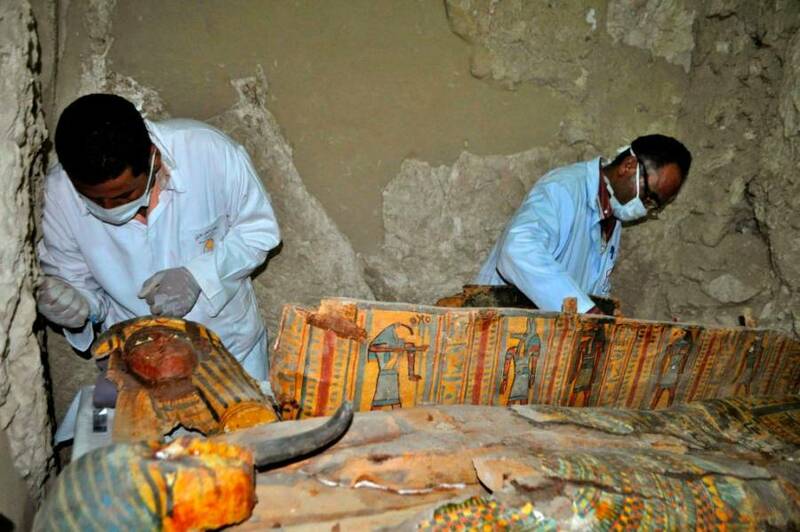 “It was a surprise how much was being displayed inside,” the country’s antiquities minister, Khaled el-Enany, said. Another room connected to the chambers has yet to be excavated, but a spokesperson said the evidence suggests more mummies may be found inside. Earlier this month, archaeologists found the remains of a previously unknown pyramid from 3,700 years ago. 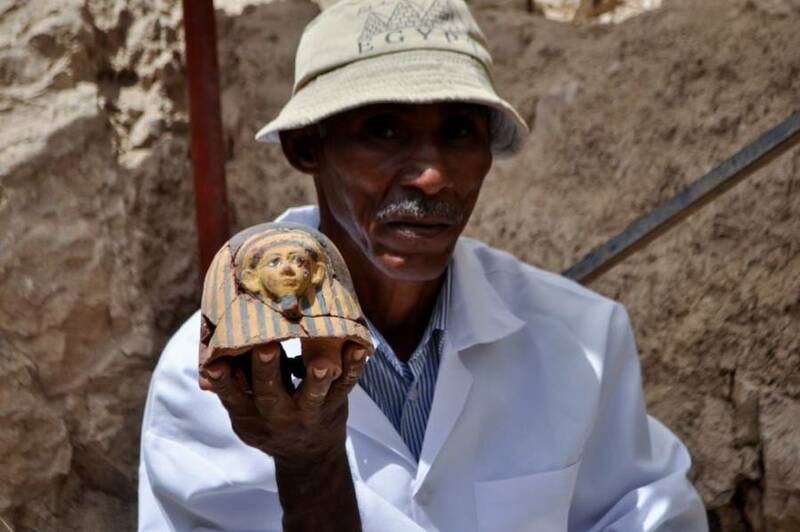 Recent digs have also uncovered 12 ancient cemeteries in the southern city of Aswan and a 26-foot statue of an ancient king in a Cairo slum. Stringer/Anadolu Agency/Getty ImagesA sculpture which was found with mummies and sarcophagus inside the grave. Officials hope the exciting archaeological discoveries will encourage a boost in tourism — an industry that has been lagging in the country in light of recent political unrest. Next, read our story on the rare child footprints recently uncovered at an ancient Egyptian royal temple. Then, learn about the remains of America’s first colonists, which archaeologists recently found underneath a Florida wine shop.